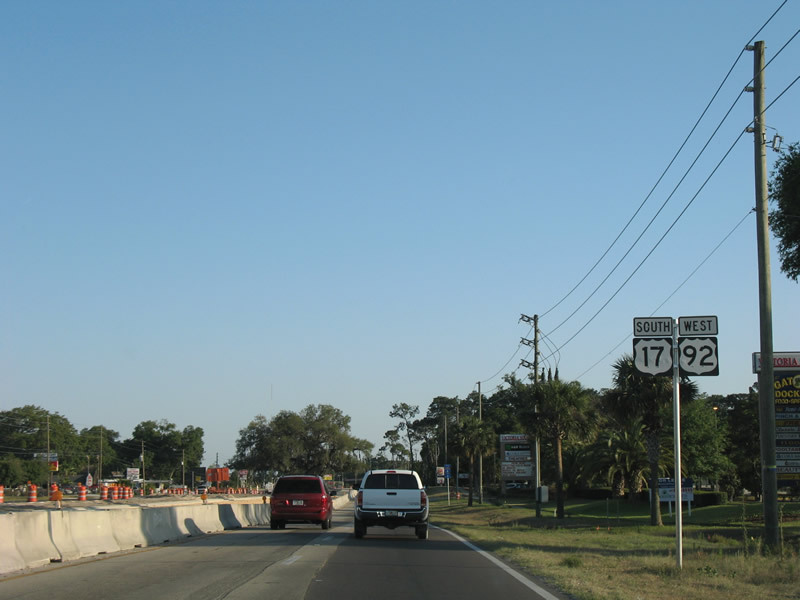 U.S. 17 and 92 merge here for a lengthy, especially when considering the intrastate routing of U.S. 92, overlap. 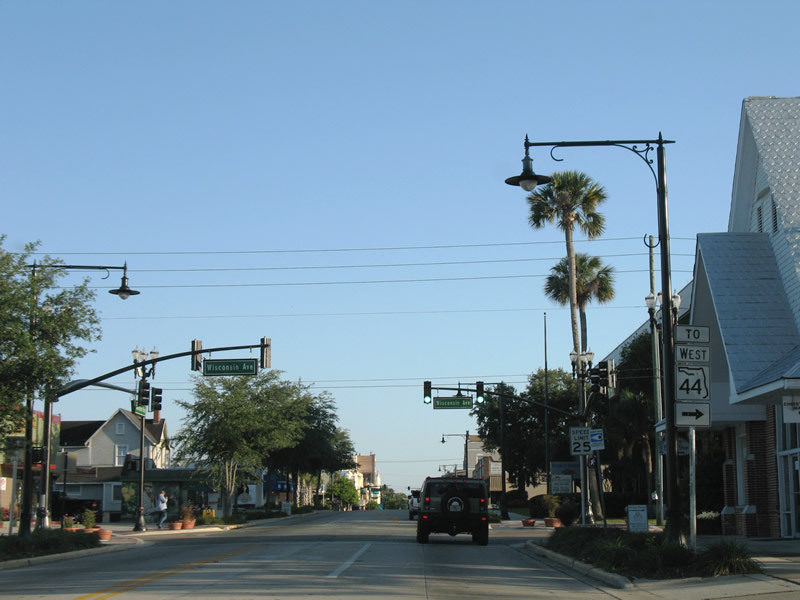 The two share pavement through Orange City, DeBary, Sanford, Orlando, Kissimmee, and Haines City before parting ways in Polk County at Auburndale. Locally the tandem are referred to simply as "17-92". Photo taken 03/21/08. U.S. 17 south & 92 (Woodland Boulevard) west reduce from four to two lanes at Plymouth Avenue (unsigned Volusia County 4092) in north DeLand. 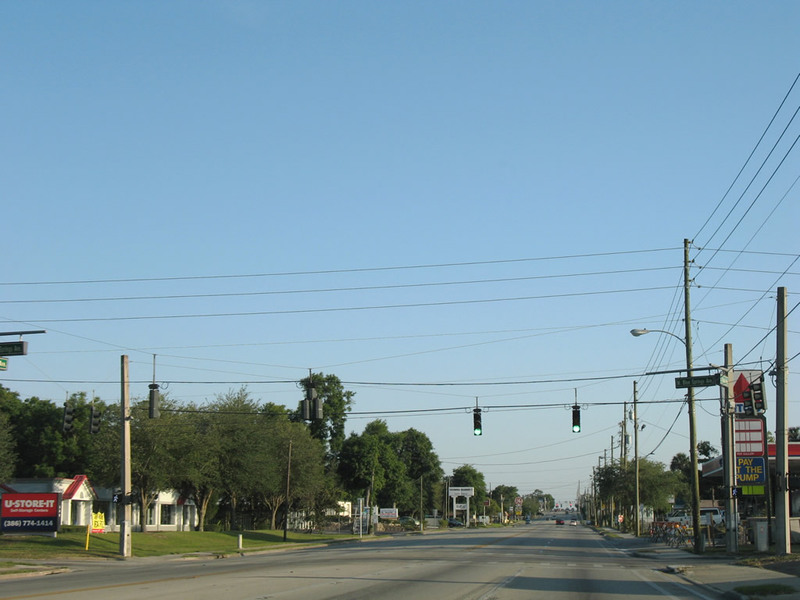 Plymouth Avenue leads east to DeLand High School and west to Florida Hospital - Deland. Photo taken 04/30/08. 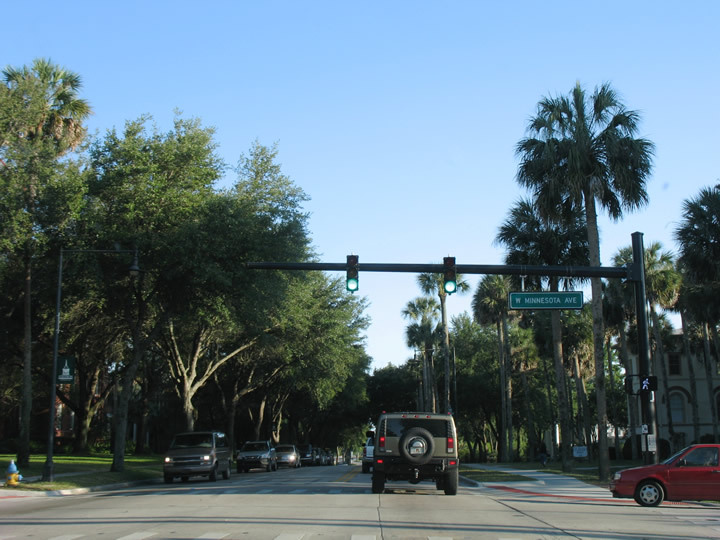 Woodland Boulevard reaches the campus of Stetson University between Pennsylvania Avenue and historic downtown DeLand. 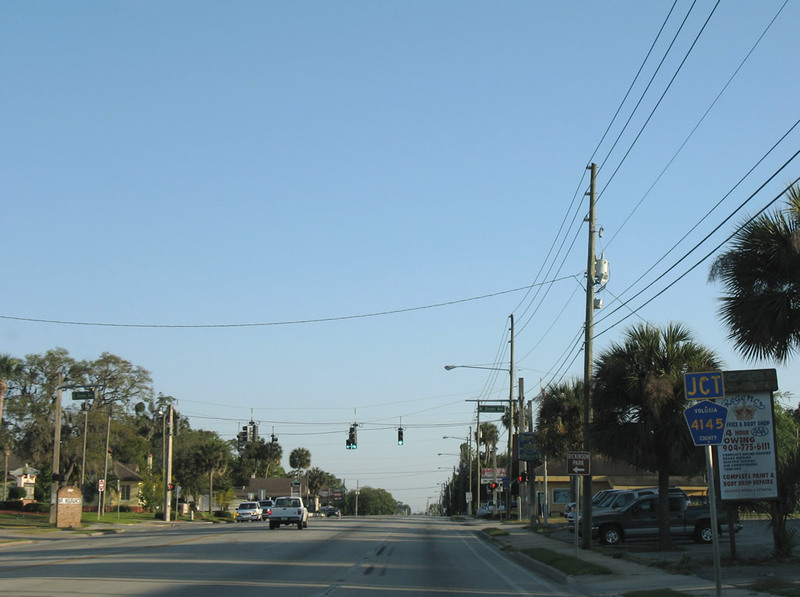 Minnesota Avenue (unsigned Volusia County 4094) intersects U.S. 17 & 92 from the west in this scene. Photo taken 04/30/08. 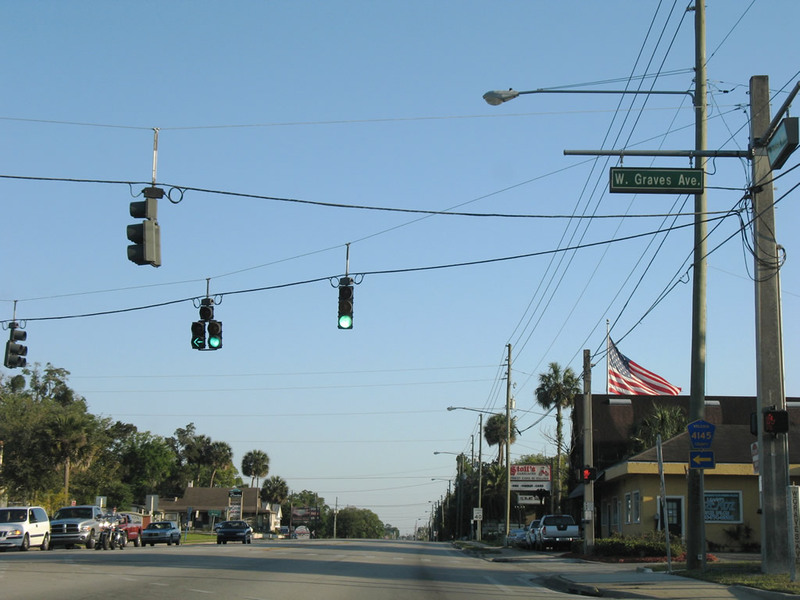 Once at downtown, U.S. 17 & 92 drivers destined for Florida 44 (New York Avenue) must depart Woodland Boulevard on separate movements to the east-west state road. 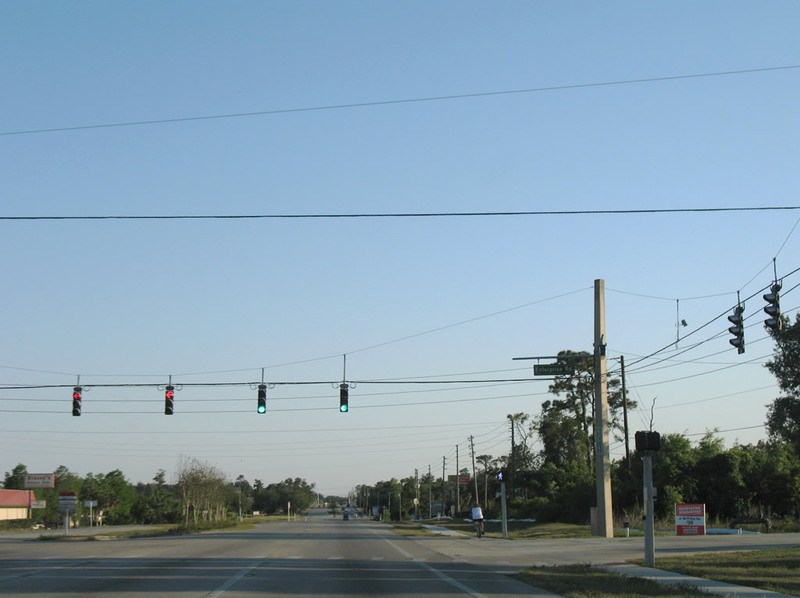 This is due to the ban on turns at the U.S. 17-92 intersection with Florida 44 itself. Photo taken 04/30/08. 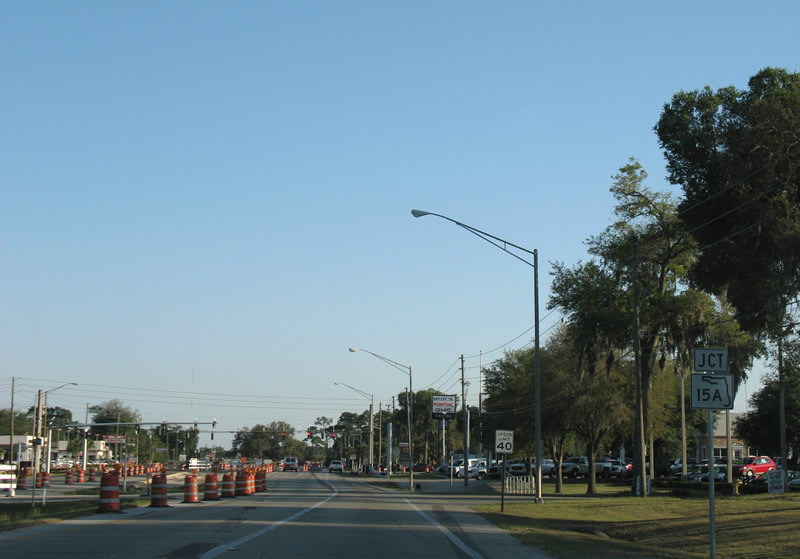 Motorists bound for Florida 44 (East New York Avenue) to New Smyrna Beach are directed onto East Ohio Avenue and Amelia Avenue south to make the connection. Photo taken 04/30/08. 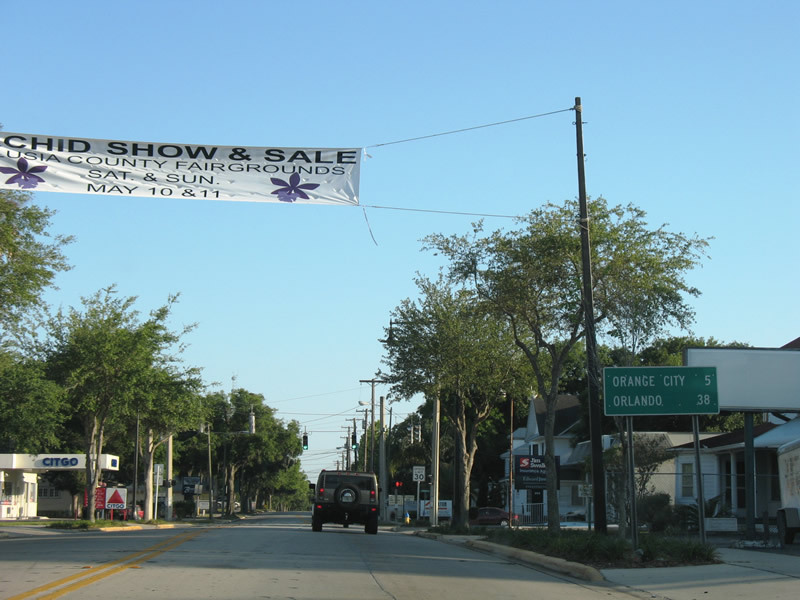 Florida 44 shields posted at Woodland Boulevard south at Ohio Avenue. The westbound connection to Florida 44 is made via West Wisconsin Avenue to Clara Avenue south. Photo taken 04/30/08. 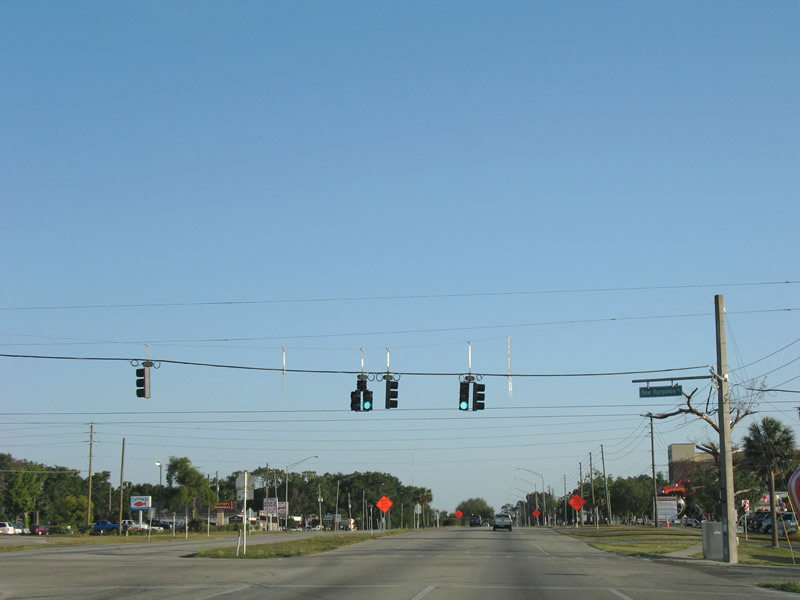 Entering the signalized intersection with West Wisconsin Avenue on U.S. 17 south & 92 (Woodland Boulevard) west. 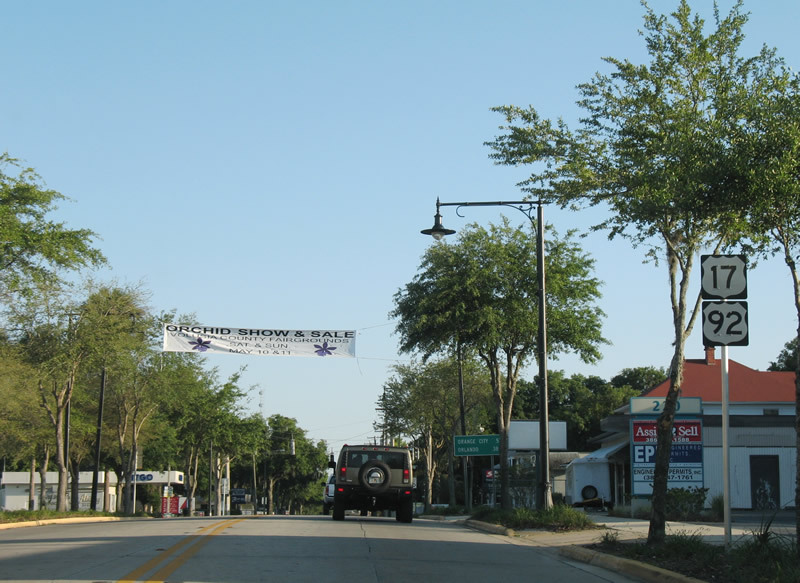 Wisconsin Avenue is considered part of unsigned Volusia County 4098 between Woodland and Clara Avenue (unsigned Volusia County 4113). Photo taken 04/30/08. 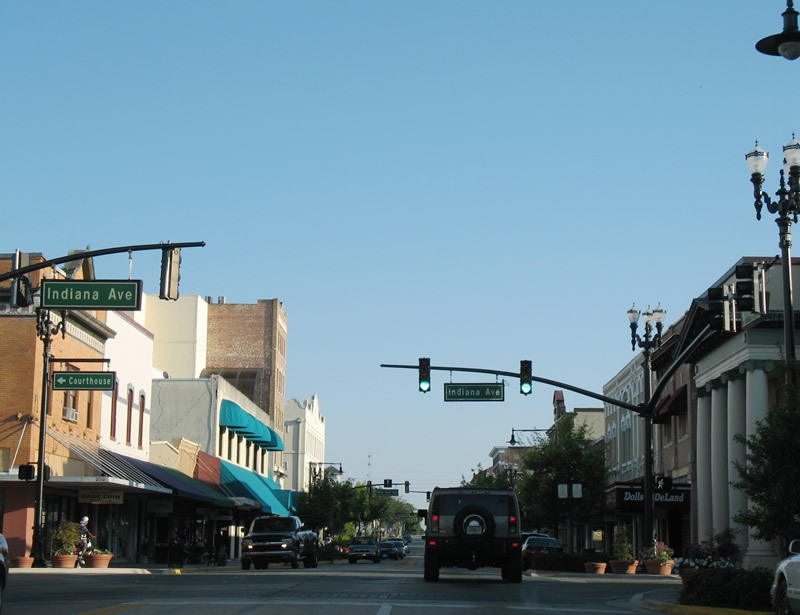 Now within historic downtown DeLand, U.S. 17 & 92 meet Rich Avenue. Photo taken 04/30/08. 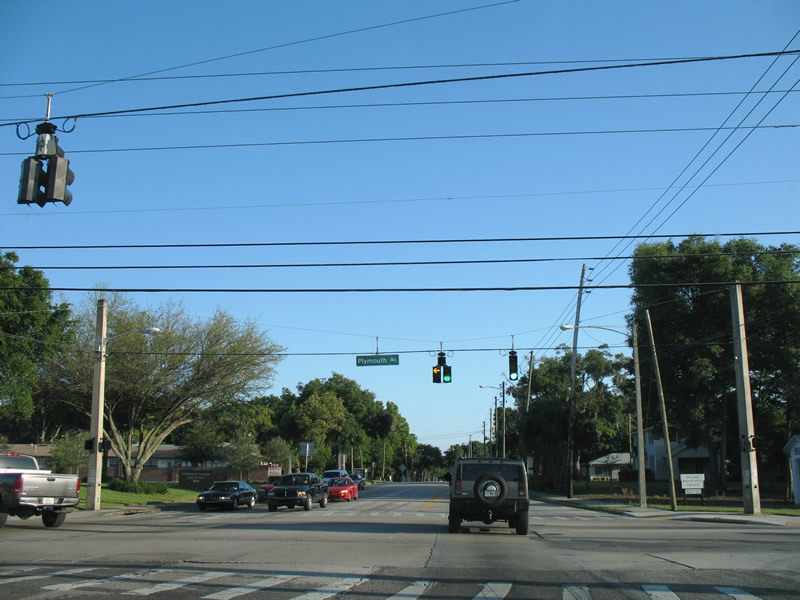 Indiana Avenue, a short connector to parallel Florida and Alabama Avenues intersects U.S. 17 & 92 (Woodland Boulevard) next. Photo taken 04/30/08. 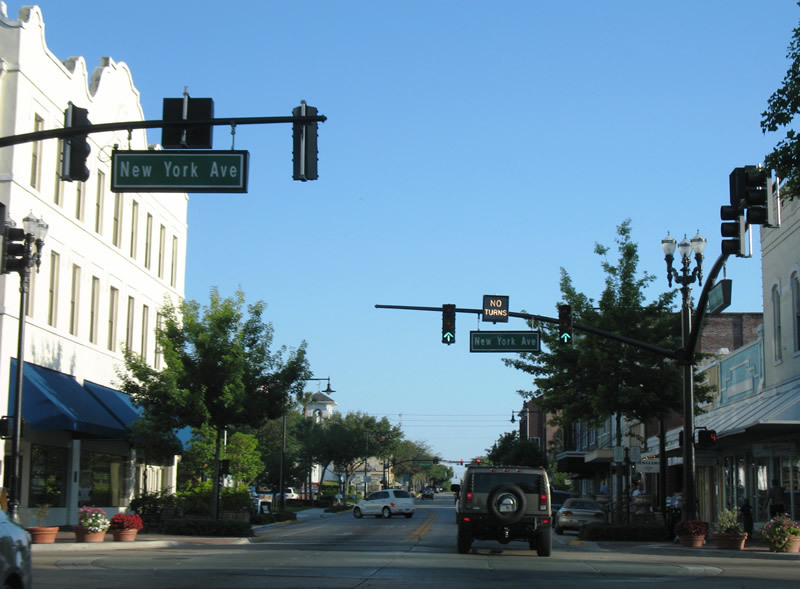 Florida 44 (New York Avenue) crosses paths with U.S. 17 south & 92 west within the heart of downtown. Turns are not permitted in any direction here. Photo taken 04/30/08. 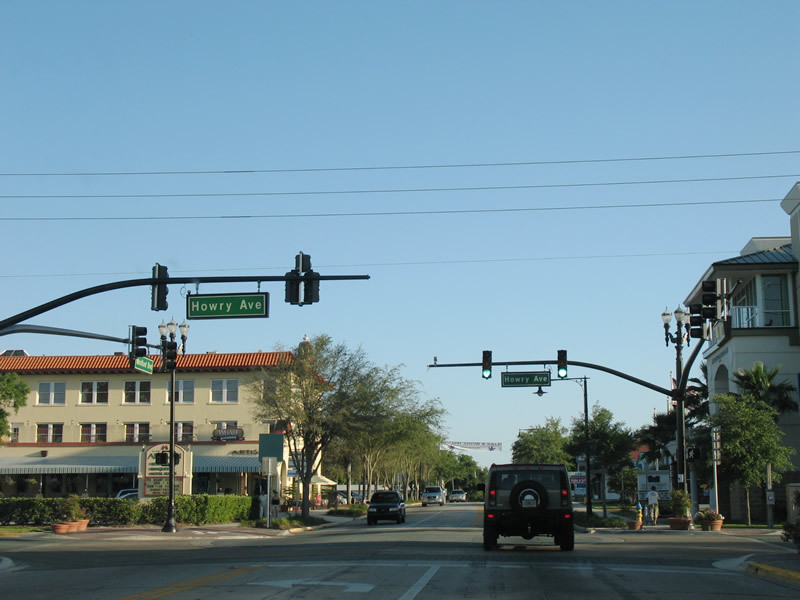 South of Florida 44, Woodland Boulevard intersects Howry Avenue. 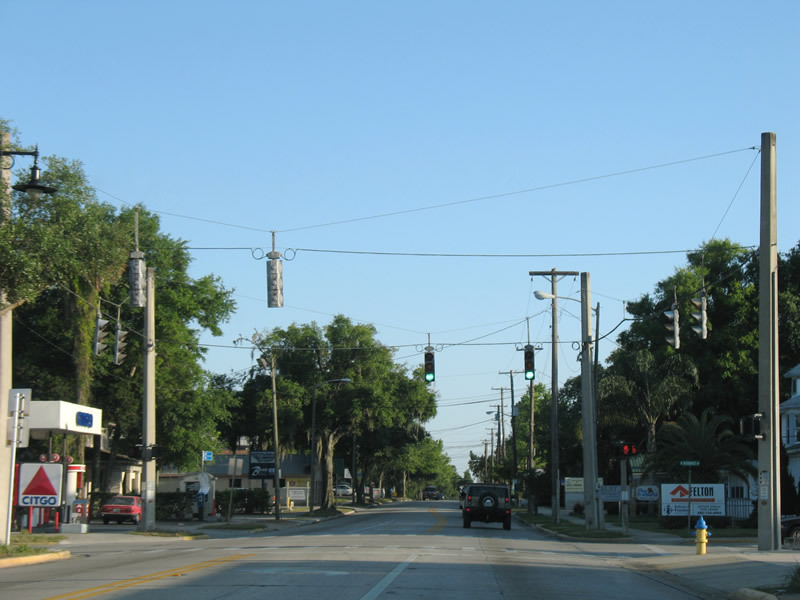 Howry Avenue provides connections from Florida 44 (New York Avenue) to U.S. 17 & 92 (Woodland Boulevard). Photo taken 04/30/08. 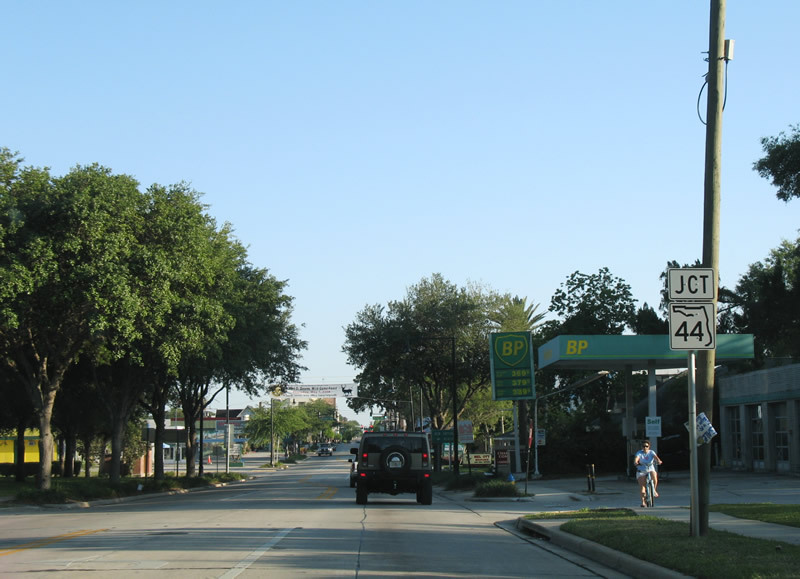 U.S. 17 & 92 reassurance shields posted after the Florida 44 connections from Howry Avenue. Photo taken 04/30/08. 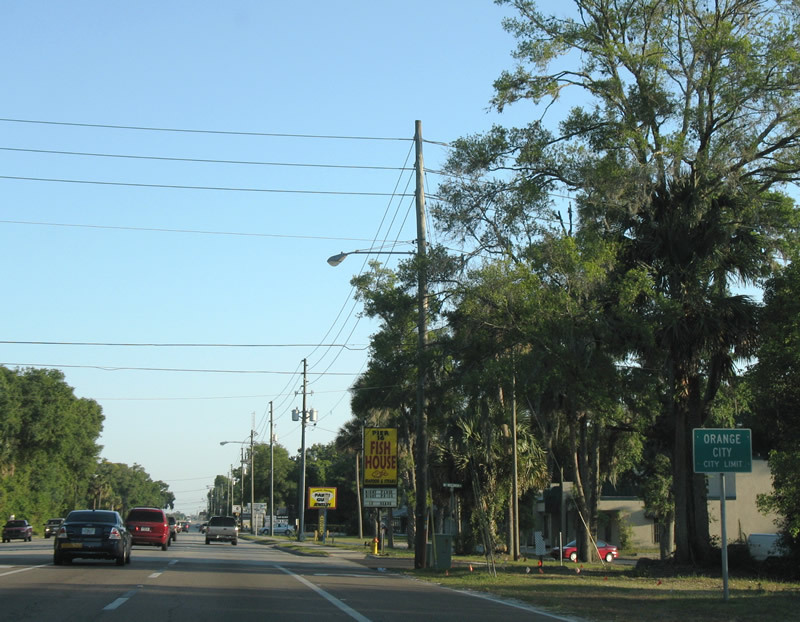 U.S. 17 south & 92 west continue five miles to central Orange City from downtown DeLand. Photo taken 04/30/08. Unsigned Volusia County 4106 follows Voorhis Avenue east from Woodland Boulevard to Florida 44 (East New York Avenue) in east DeLand. Photo taken 04/30/08. Additional U.S. 17 & 92 shields posted on Woodland Boulevard south of Voorhis Avenue. Photo taken 04/30/08. 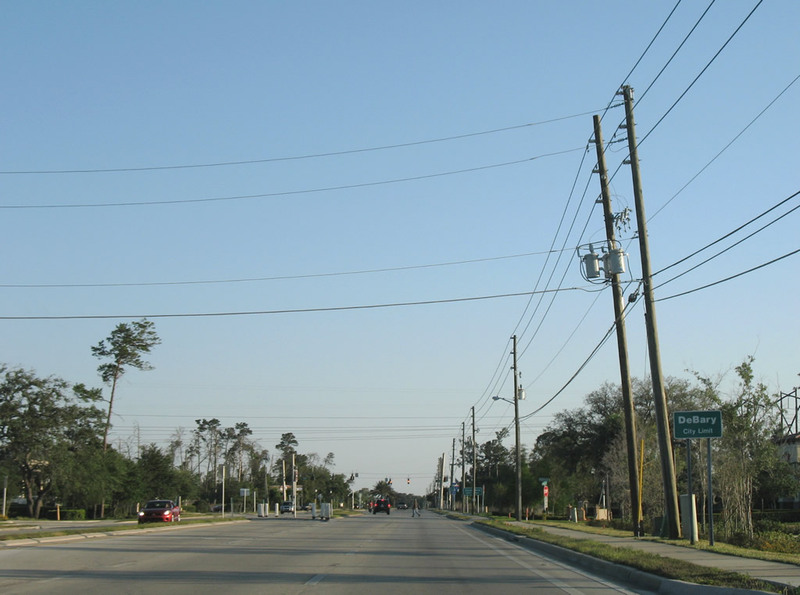 Beresford Avenue (unsigned Volusia County 4112) crosses paths with U.S. 17 & 92 (Woodland Boulevard) between Southridge Golf Course and Florida 15A (Spring Garden Avenue). Photo taken 04/30/08. U.S. 17 & 92 widen to four lanes and gain a grassy median south of Beresford. Photo taken 04/30/08. 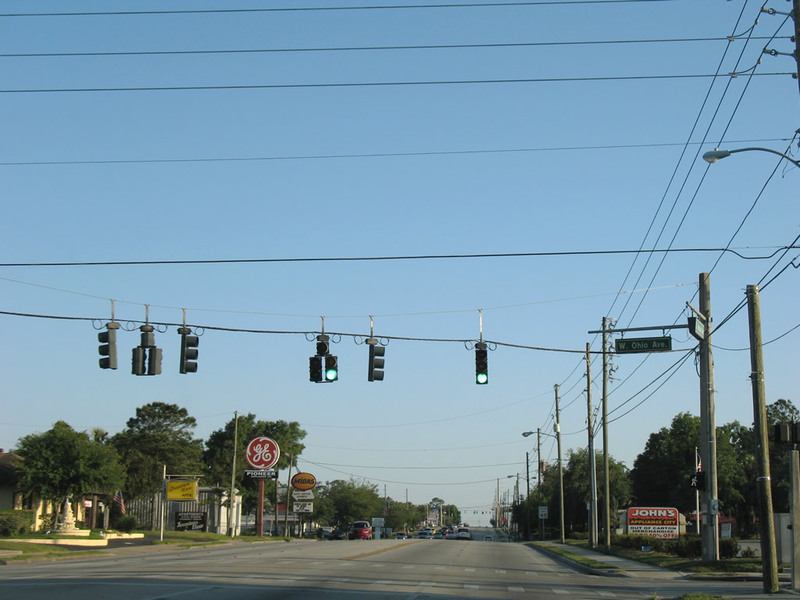 New Hampshire Avenue (unsigned Volusia County 4114) intersects U.S. 17 & 92 (Woodland Boulevard) in south DeLand. The county road ends at Amelia Avenue to the east and Florida 15A to the west. Photo taken 04/30/08. 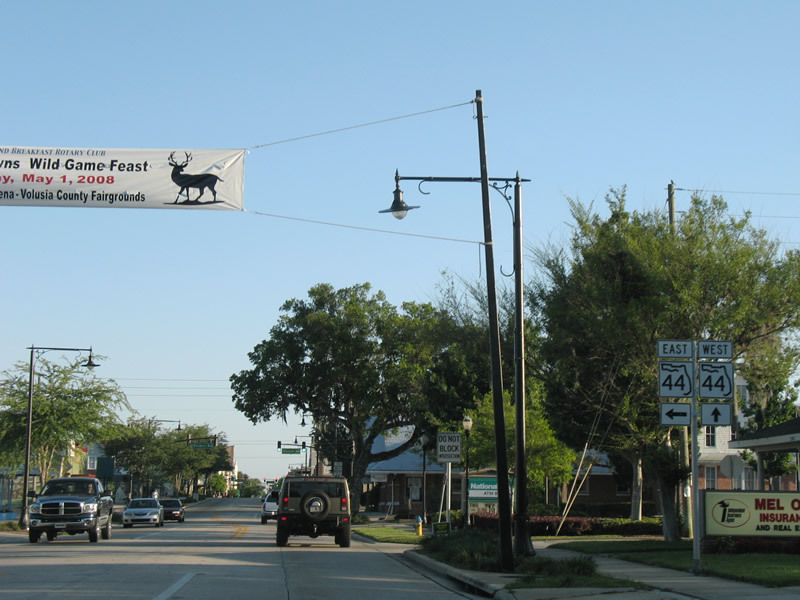 Florida 15A (Taylor Road) returns to its parent Florida 15, the unsigned designation of U.S. 17, in south DeLand. 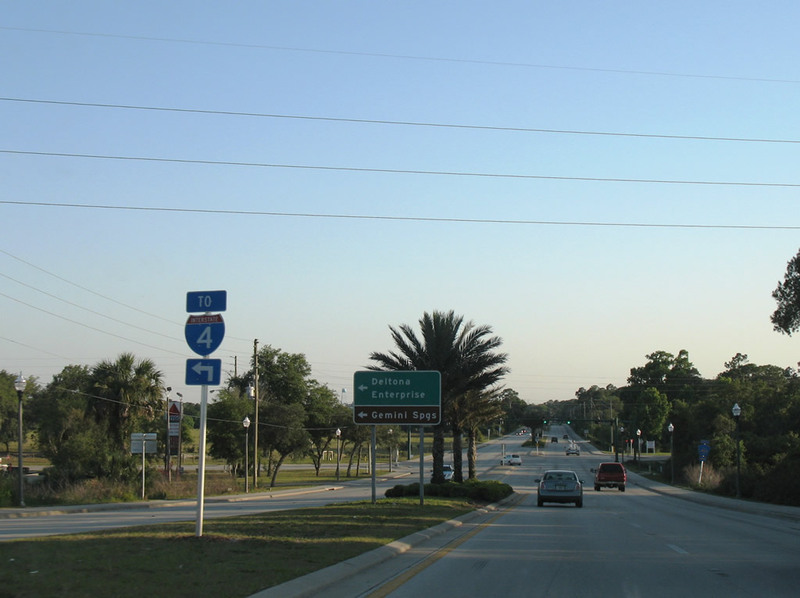 Florida 15A provides the truck bypass of DeLand from Florida 44 (West New York Avenue) to the west and U.S. 17 and Florida 11 to the north. Photo taken 04/30/08. 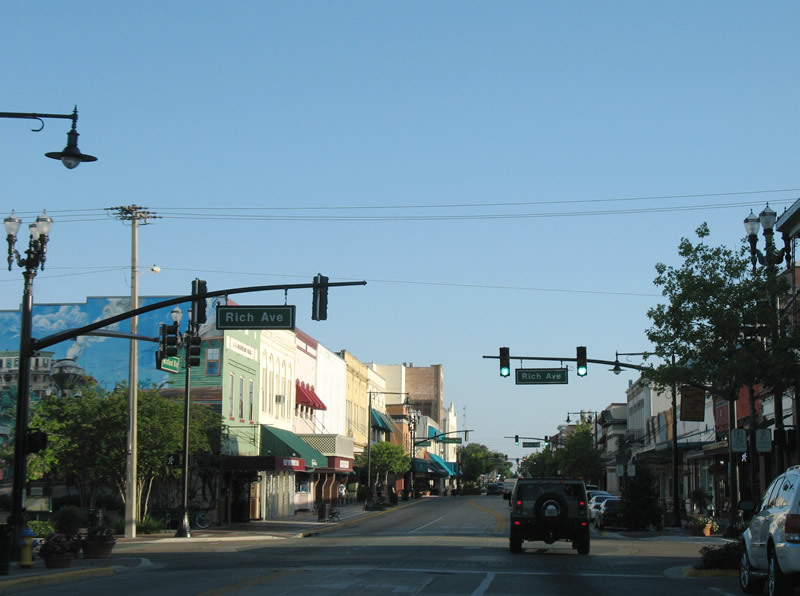 Florida 15A provides a four-lane route via Taylor Road and Spring Garden Avenue around central DeLand. Taylor Road east continues to Volusia County 4101 (Dr. Martin Luther King Jr. Beltway). Photo taken 04/30/08. 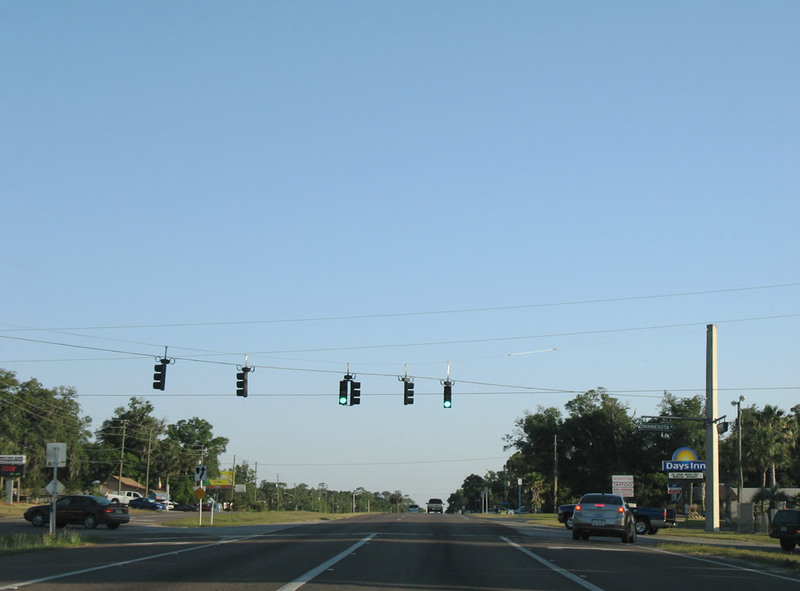 Still in DeLand, U.S. 17 south & 92 west continue as a commercial arterial. Photo taken 04/30/08. 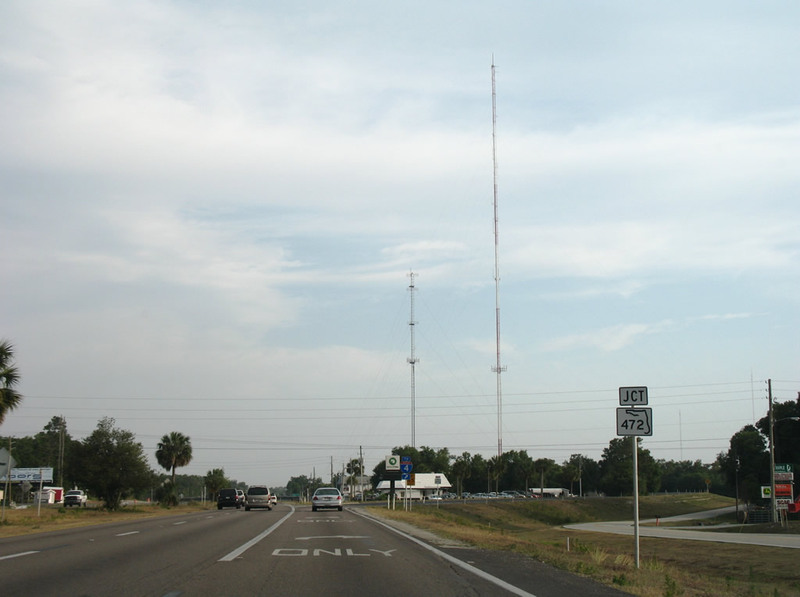 Several connections exist between U.S. 17 & 92 and the parallel Interstate 4 to the east. 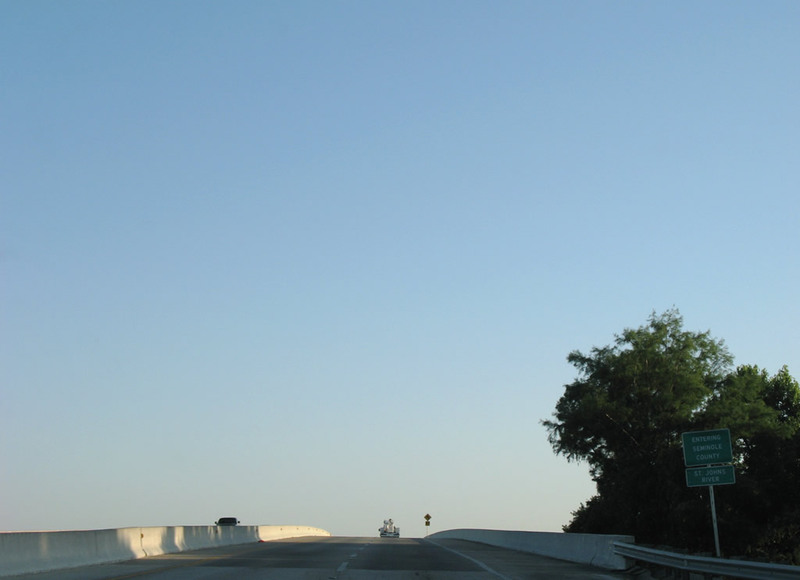 Trailblazers are posted to all of the south Volusia interchanges of the freeway. Photo taken 04/30/08. 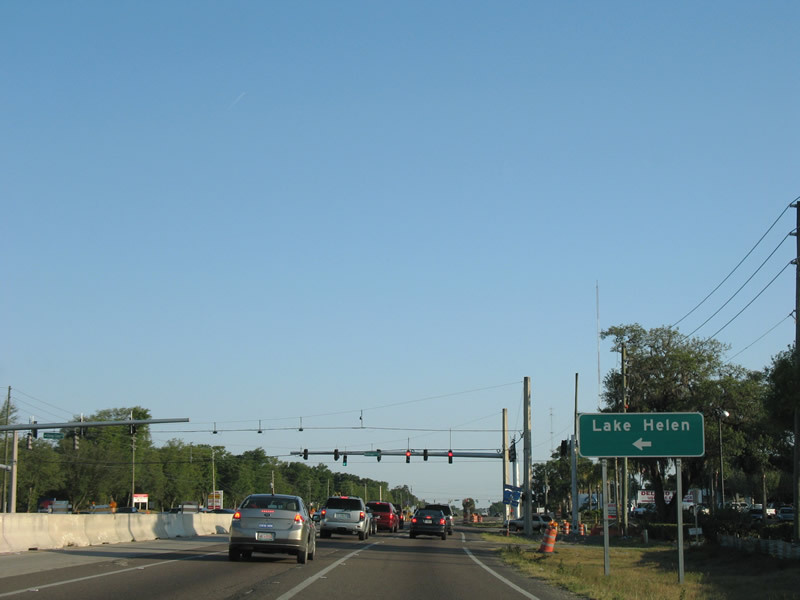 Volusia County 4116 (Orange Camp Road) links U.S. 17 & 92 (Woodland Boulevard) with the city of Lake Helen east of Interstate 4. Photo taken 04/30/08. Volusia County 4116 only travels between Woodland Boulevard and Exit 116 of Interstate 4. McGregor Road leading west to the Lake Beresford Greenway is not apart of the county road. Photo taken 04/30/08. 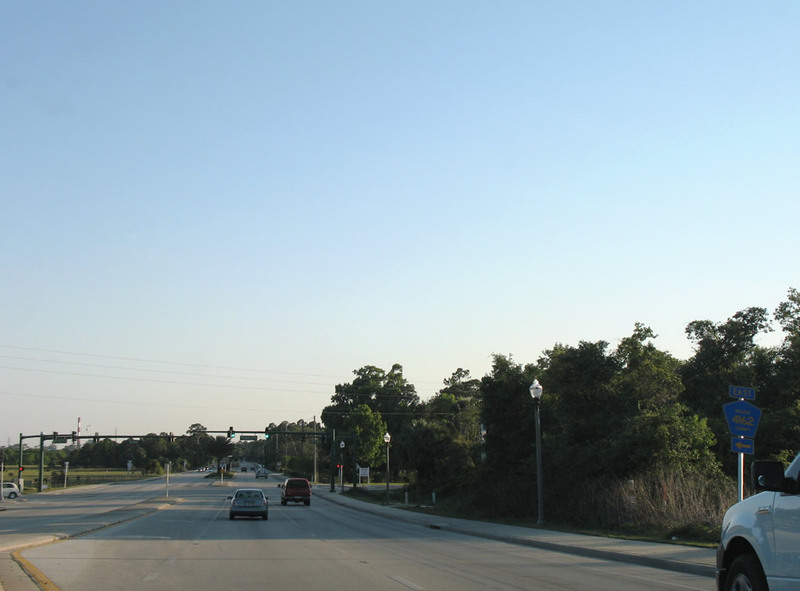 Florida 472 begins at a trumpet interchange with U.S. 17 & 92 ahead of Orange City. Photo taken 04/30/08. 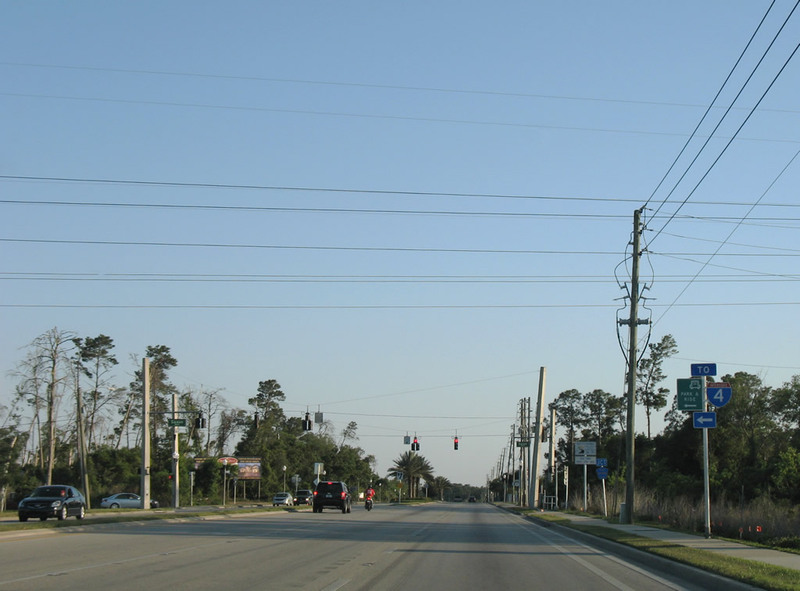 Florida 472 provides a four-lane divided highway between U.S. 17 & 92 and junction Interstate 4 (Exit 114) and Volusia County 4145 (Howland Boulevard). Photo taken 05/15/08. 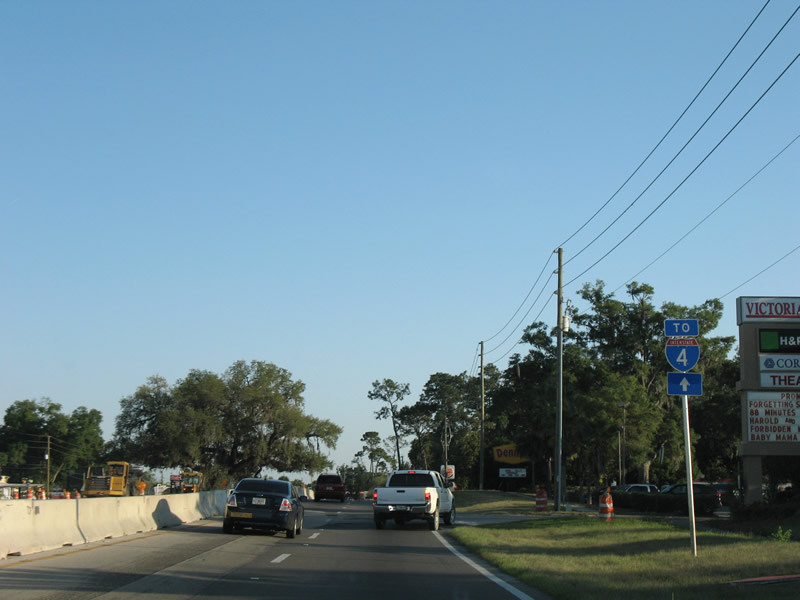 Interstate 4's interchange with Florida 472 was reconfigured from a trumpet interchange into a parclo as Volusia County 4145 was extended northwest from Howland Boulevard. Photo taken 04/30/08. 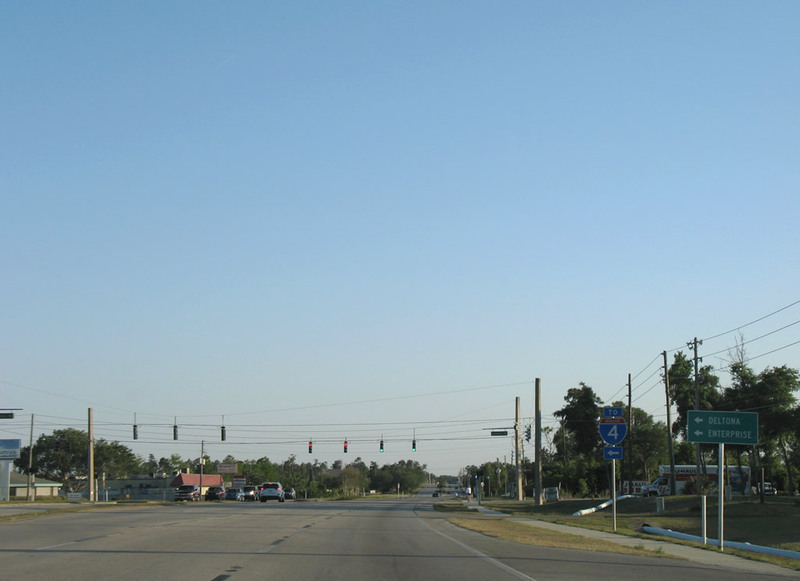 U.S. 17 & 92 southbound at the beginning of Florida 472 in Orange City. 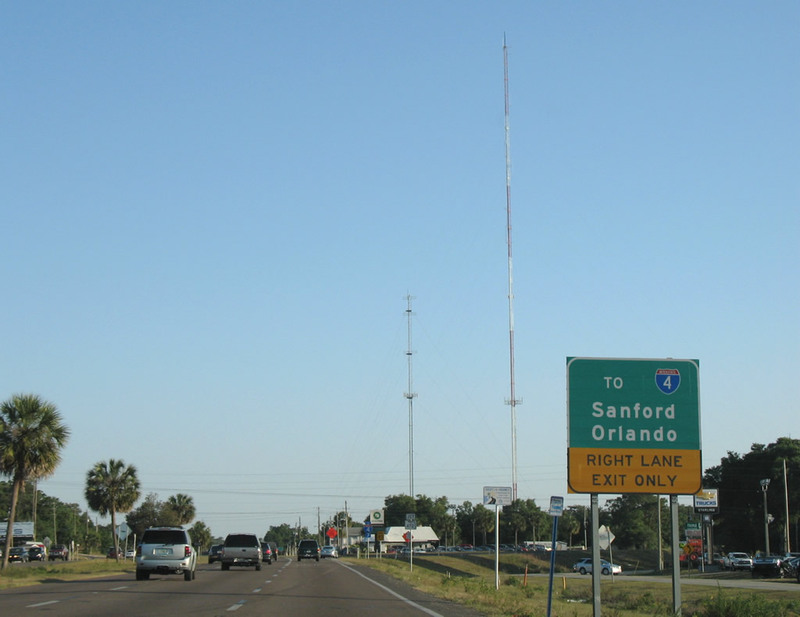 Florida 472 south to Interstate 4 allows drivers to bypass Orange City and DeBary for Sanford and Orlando. Photo taken 04/30/08. 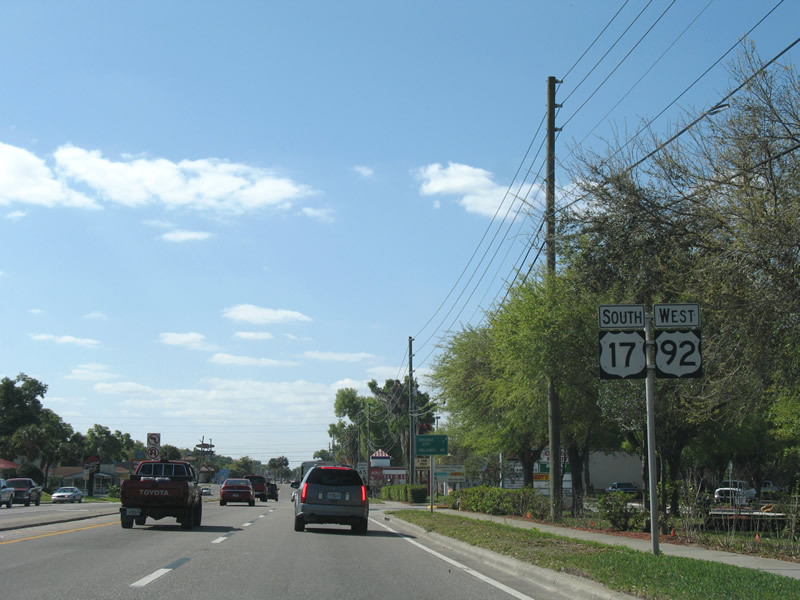 Remaining along U.S. 17 south & 92 west takes travelers directly into Orange City. Photo taken 04/30/08. 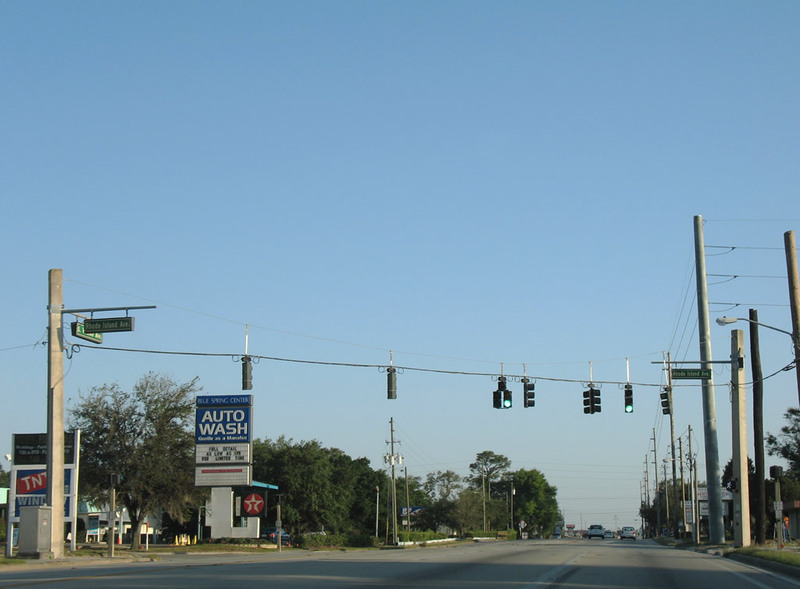 Minnesota Avenue crosses U.S. 17 & 92 south of Florida 472. The street leads east to the state road and west to Hamilton Avenue. Photo taken 04/30/08. Following Minnesota Avenue is the intersection with New York Avenue. 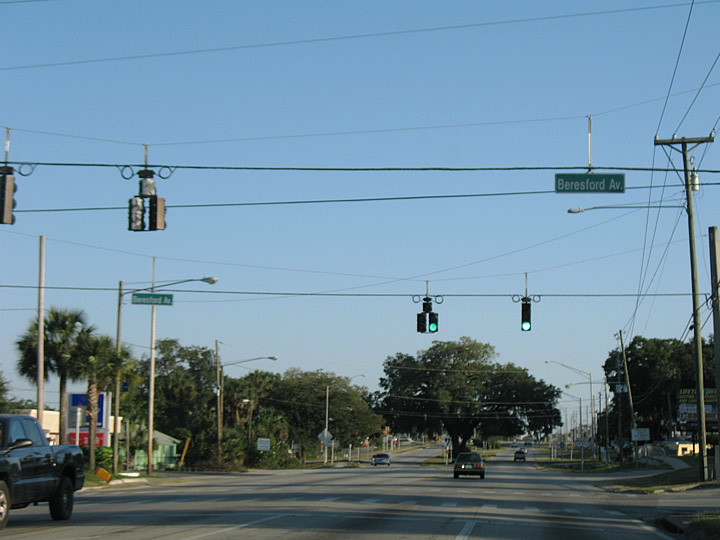 New York Avenue spurs west from U.S. 17 & 92 to Hamilton Avenue. Photo taken 04/30/08. 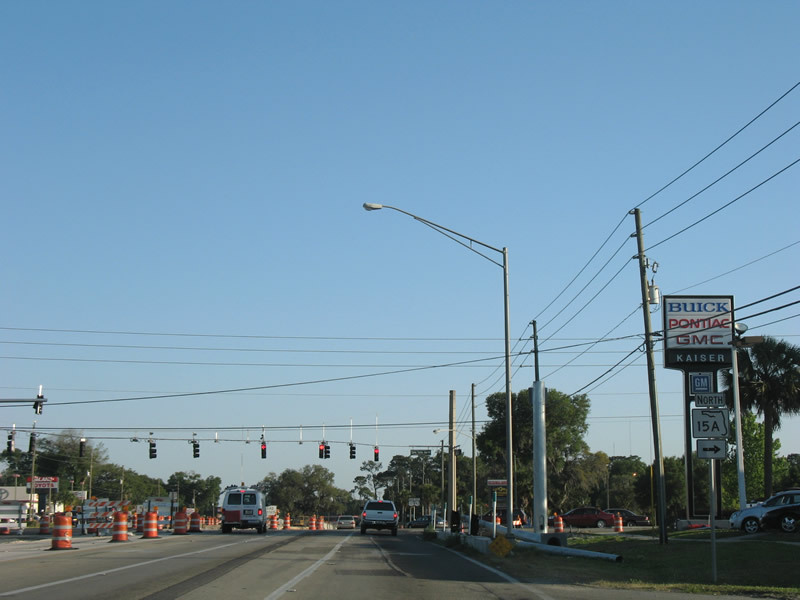 U.S. 17 & 92 officially enter the Orange City limits ahead of Wisconsin Avenue. Photo taken 04/30/08. 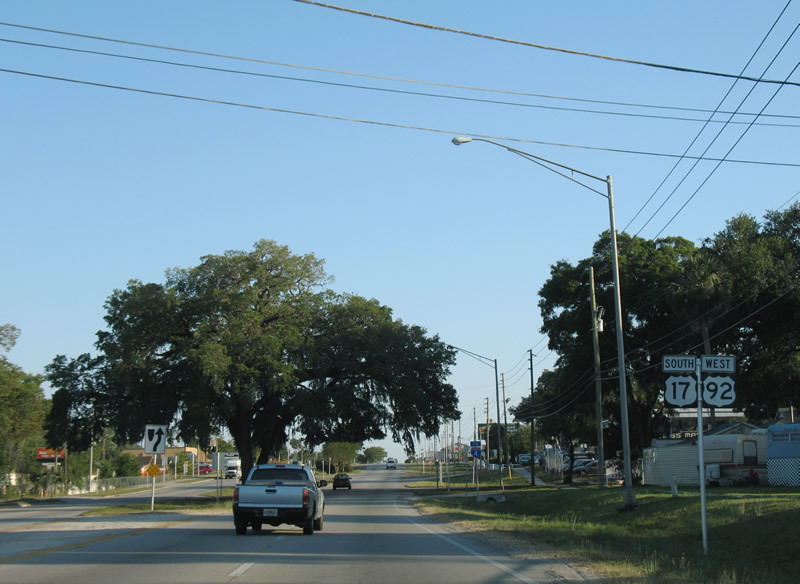 Entering the intersection with French Avenue on U.S. 17 south & 92 west in Orange City. French Avenue leads west to Blue Spring State Park on the St. Johns River. Photos taken 04/30/08. 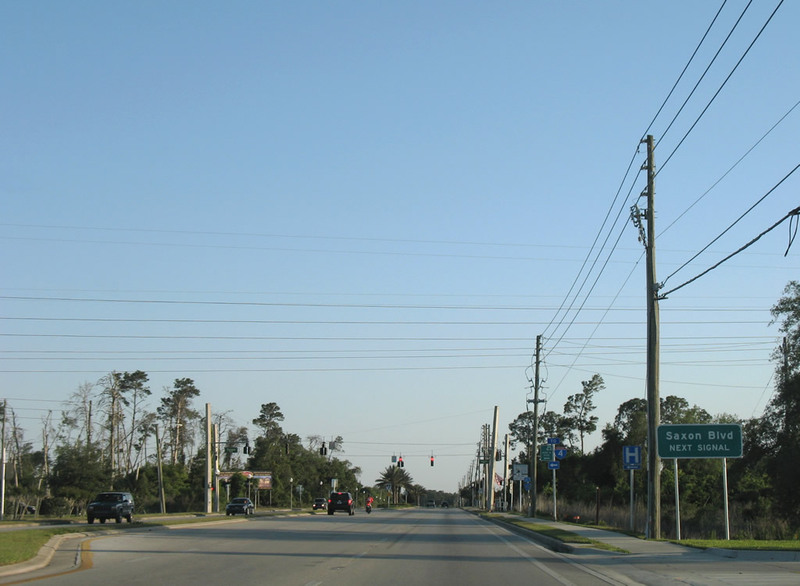 Volusia County 4145 follows Graves Avenue east from U.S. 17 & 92 to Howland Boulevard in Deltona. Photo taken 04/30/08. 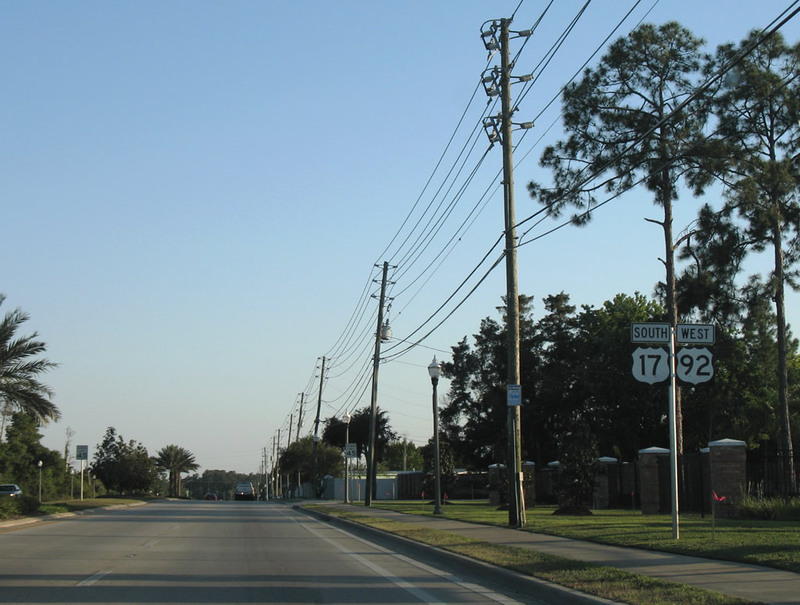 U.S. 17 south & 92 westbound at the eastbound beginning of Volusia County 4145 (Graves Avenue) in central Orange City. 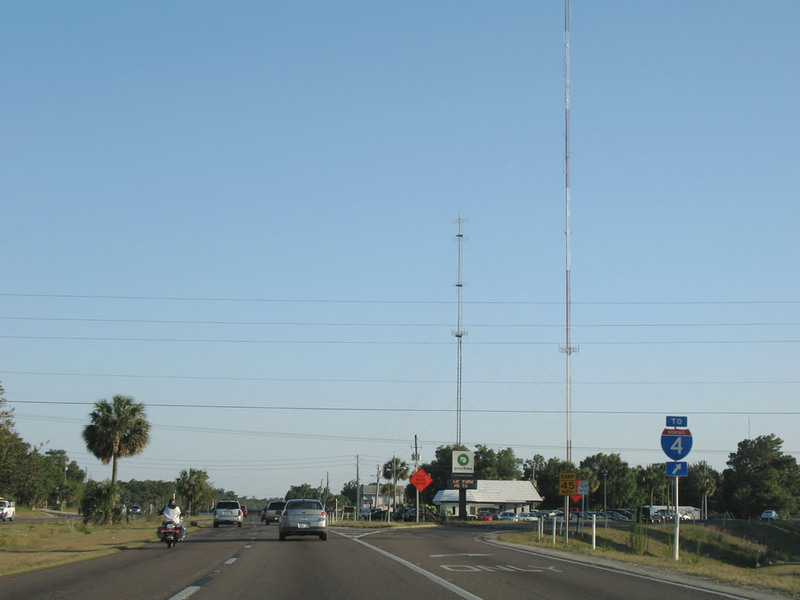 Volusia 4145 (Howland Boulevard) encircles Deltona from the Florida 472 interchange with Interstate 4 through to Florida 415 along the east side of town. Photo taken 04/30/08. 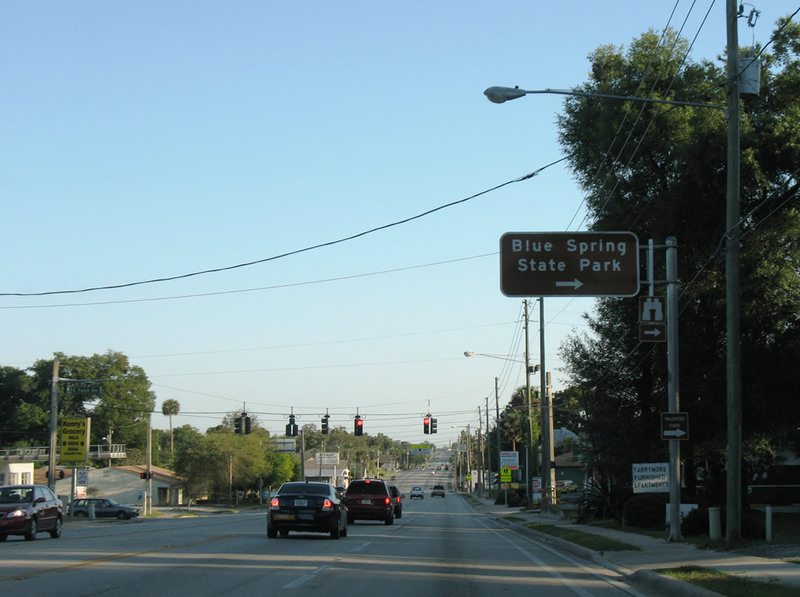 Blue Springs Avenue meets U.S. 17 & 92 a half mile south of Volusia County 4145. Photo taken 04/30/08. Continuing the state-named street sequence of Orange City is Ohio Avenue. Photo taken 04/30/08. Rhode Island Avenue leads west to residential areas via Adeline Street and east from U.S. 17 & 92 to Veterans' Memorial Parkway, a bypass route through east Orange City. Photo taken 04/30/08. Enterprise Road veers southeast from its beginning at U.S. 17 & 92 to Saxon Boulevard (Volusia County 4146) west of Interstate 4 Exit 111. Photo taken 04/30/08. 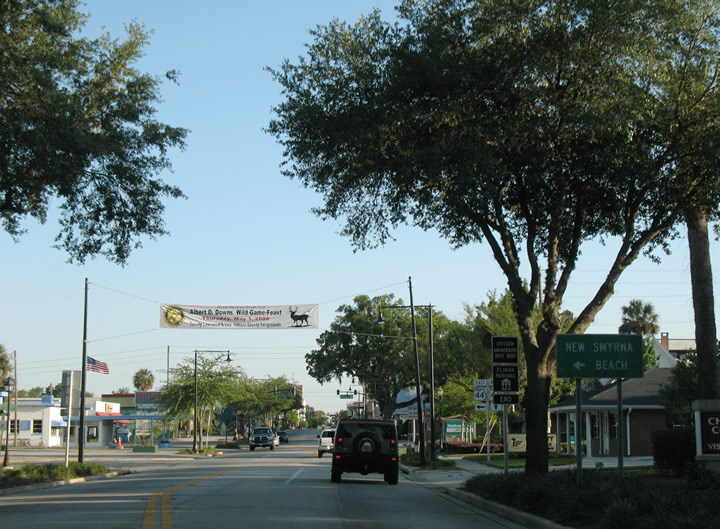 Beyond Interstate 4, Enterprise Road enters Deltona before turning south at Main Street through the village of Enterprise. Photo taken 04/30/08. 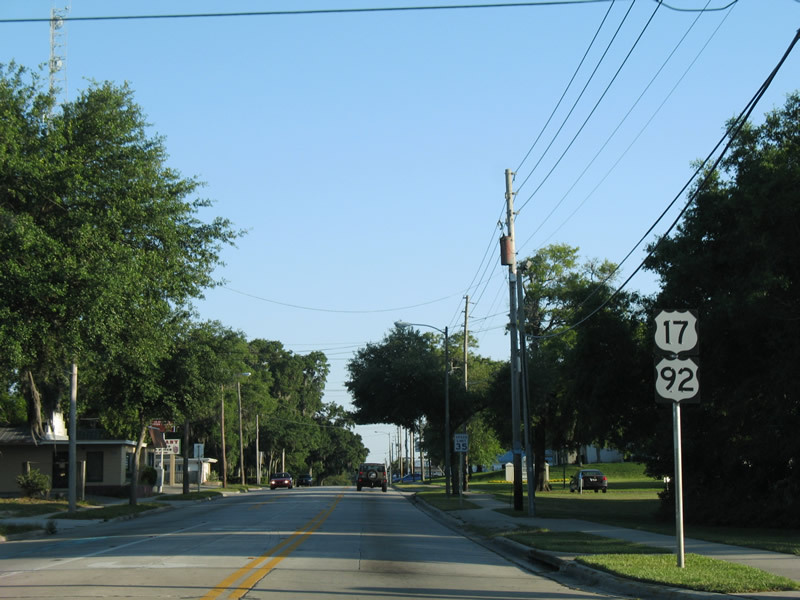 U.S. 17 & 92 enter the city of DeBary after Orange City. Photo taken 04/30/08. 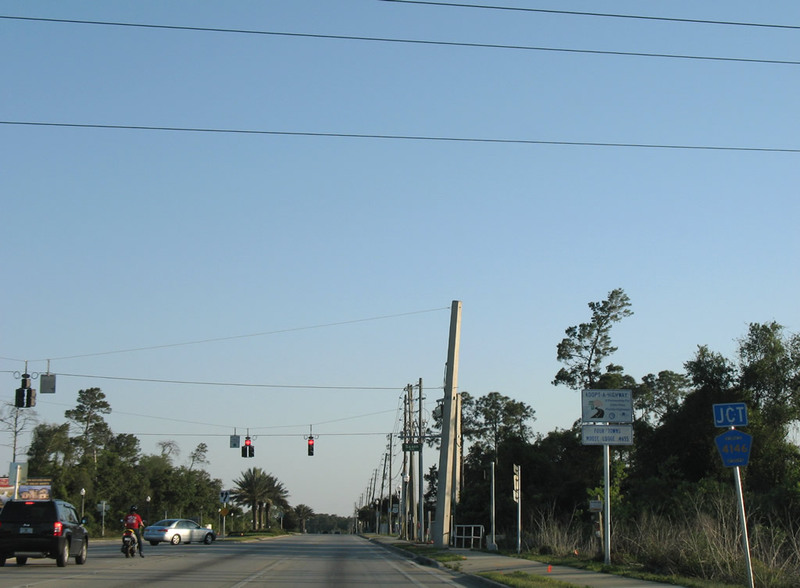 Volusia County 4146 (Saxon Boulevard) begins and heads east from U.S. 17 & 92 in DeBary to Enterprise Road and junction Interstate 4. Photos taken 04/30/08. 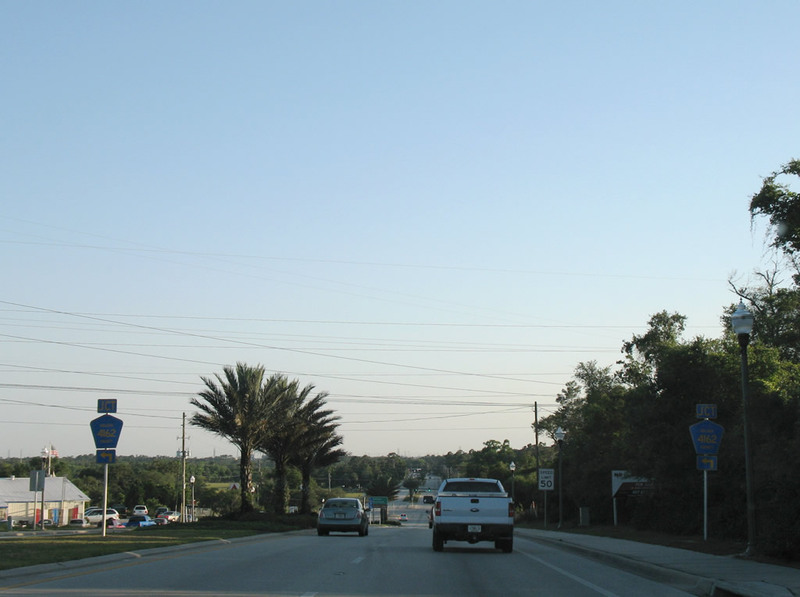 Southbound at the eastbound beginning of Volusia County 4146. Volusia County 4146 follows all of Saxon Boulevard through Deltona to Volusia County 4162. Photo taken 04/30/08. 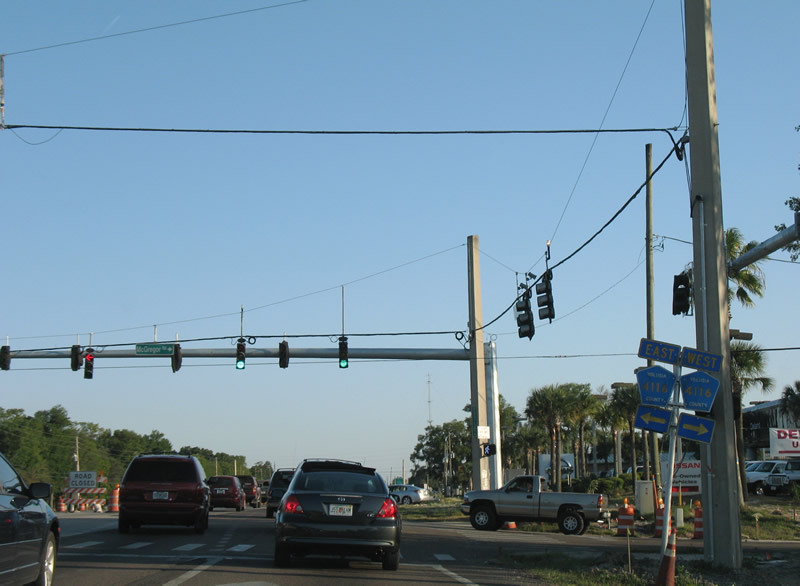 Reassurance shields for U.S. 17 south & 92 west posted after the intersection with Saxon Boulevard. Photo taken 04/30/08. 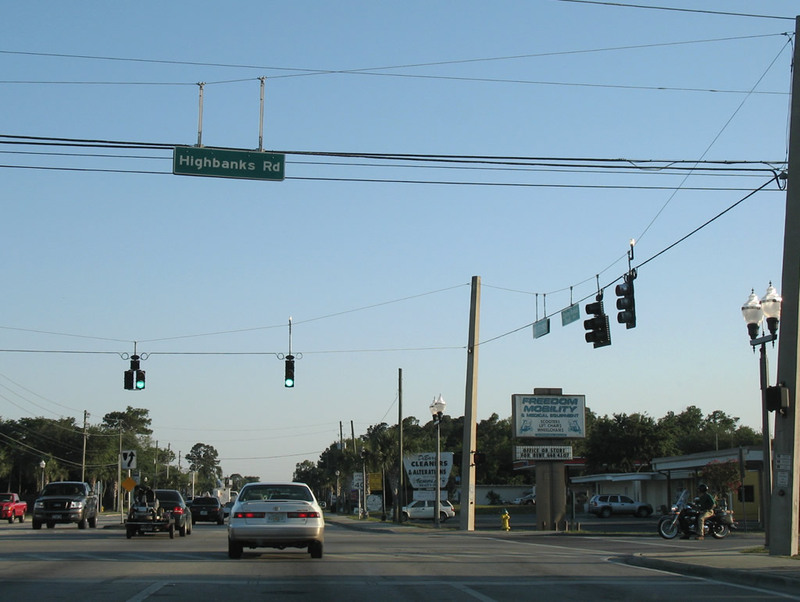 Highbanks Road crosses U.S. 17 & 92 at this intersection following traffic lights with DeBary Plantation Boulevard and Dogwood Trail. Highbanks travels west to the St. Johns River and east to Enterprise Road. Photo taken 04/30/08. 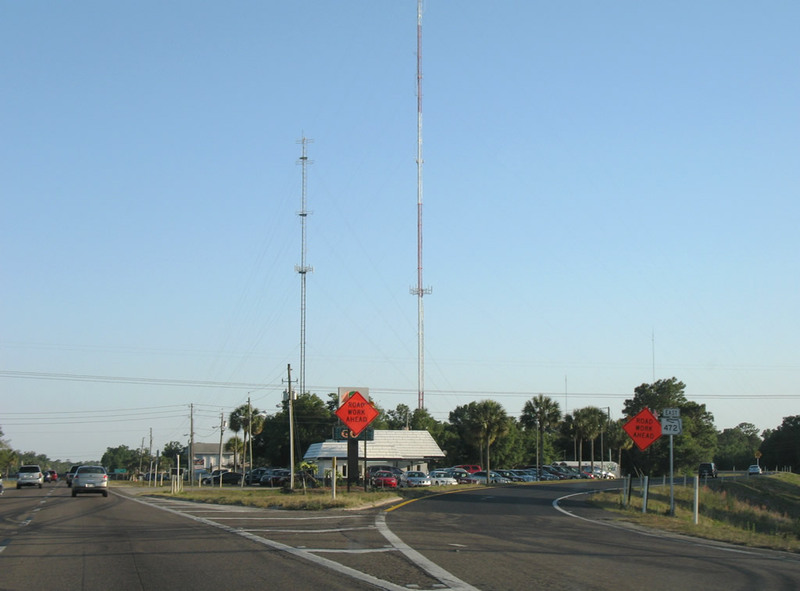 U.S. 17 & 92 angle southwestward to Volusia County 4162 (Dirksen Drive) at Benson Junction in DeBary. Photo taken 04/30/08. Volusia County 4162 meanders along the northern periphery of Lake Monroe through Enterprise and Deltona to Florida 415 at Osteen. Photo taken 04/30/08. 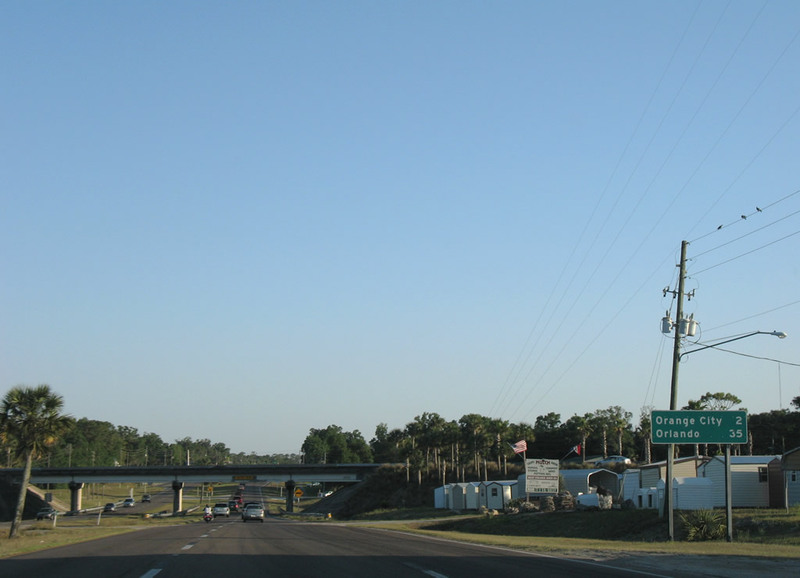 Dirksen Drive carries Volusia County 4162 east to Exit 108 of Interstate 4; DeBary Avenue continues the road into Enterprise. Photo taken 04/30/08. 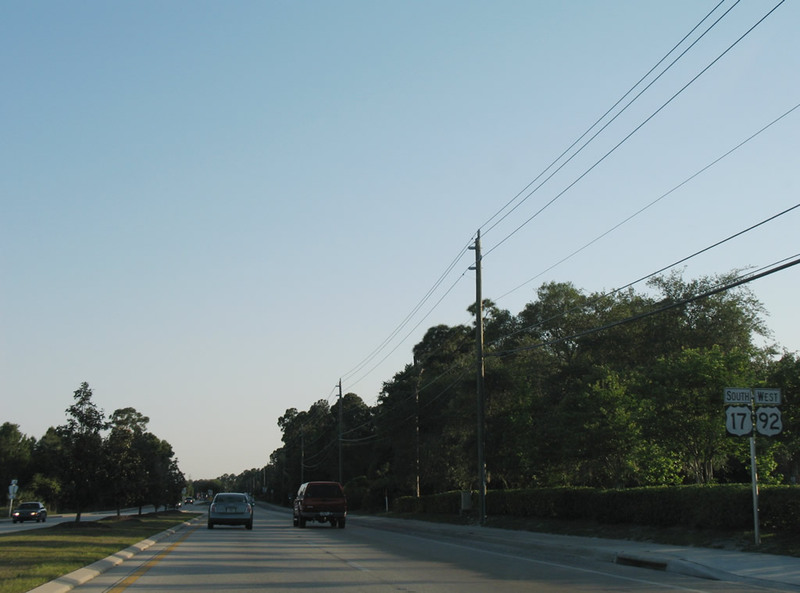 U.S. 17 & 92 leave the built-up area of DeBary en route to Lake Monroe and Sanford. Photos taken 04/30/08. 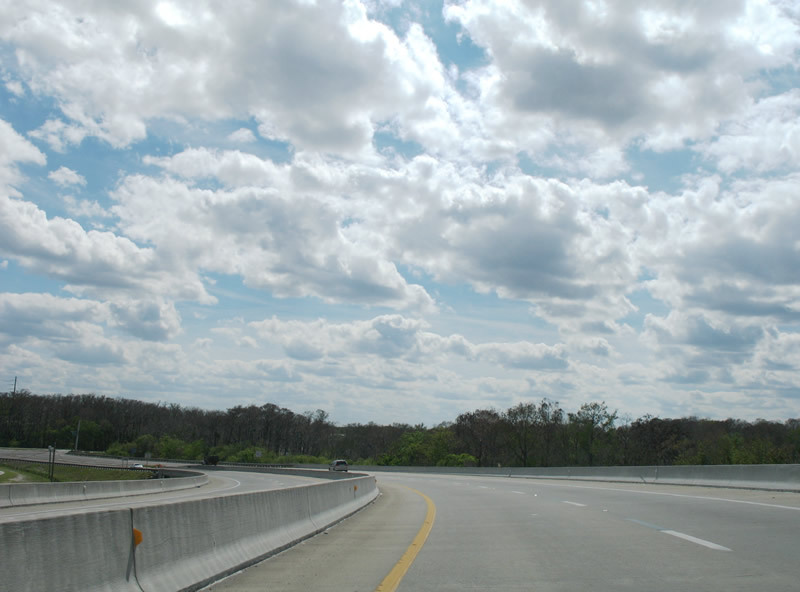 U.S. 17 south & 92 west span the St. Johns River at the Valdez area of south DeBary to enter Seminole County. Designated the Benedict Bridge, the four-lane span opened in 1994 to replace a two-lane truss bridge below. Photos taken 04/30/08 & 02/29/08. Page Updated December 2, 2008.